a woman finds a child, educates a wolf and learns the pattern of chance. In Hearts and Tongues we explore our sublime, contentious and ever-evolving relationship to the natural world through a series of unfolding images. In an attempt to explore a pre-rational sense of experience and time, text is used sparsely and meaning is simply the accumulation of sensorial events. These events have a resonant familiarity of mythology yet elude the comfort of story that the rational mind craves. In this way we hope to encourage an open-focused, receptive and active experience for the audience that allows the peripheral “vision” of the mind and body to freely make its associations and arrive at its truths. Hearts and Tongues premiered at the KO Festival of Performance in Amherst, Massachusettes in the summer of 2008. 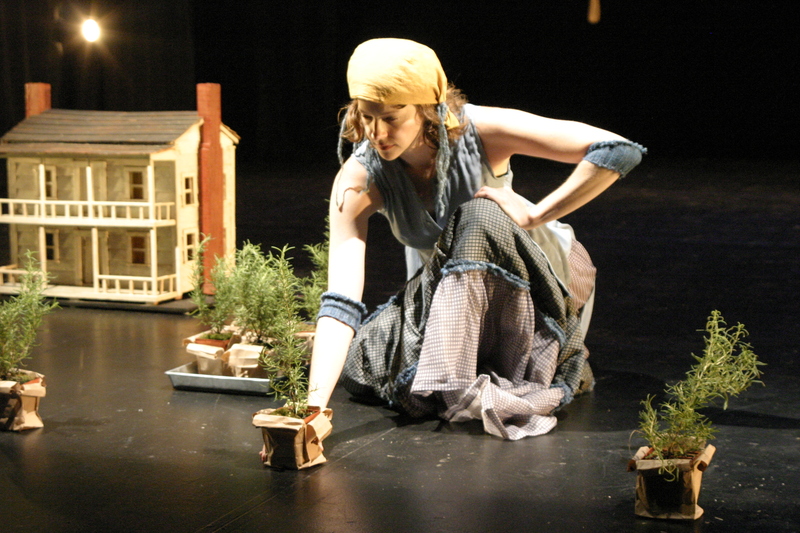 In October we presented the show for two weeks at La Mama in New York and in May of 2009 at the Loft in Baltimore.